As I mentioned in a previous post on dental photography, I’ve been working to create Before/After videos of the different procedures we offer, and while they do take some time to put together, I am getting more of them completed. Here’s one that describes a little more about the process of Six-Month Braces and what we can do for you to create a more beautiful smile. 2) They require a significant financial investment. 2) The investment is much much lower. With no further ado, let me introduce Jeremy, whose case we just finished today. He plans on whitening his teeth in 2009 to complete the Short-Term Ortho Smile Makeover. And please keep in mind: We achieved this result for Jeremy in only FOUR MONTHS! Needless to say, he was a very happy camper when we took off the brackets today. Wouldn’t you be, too? 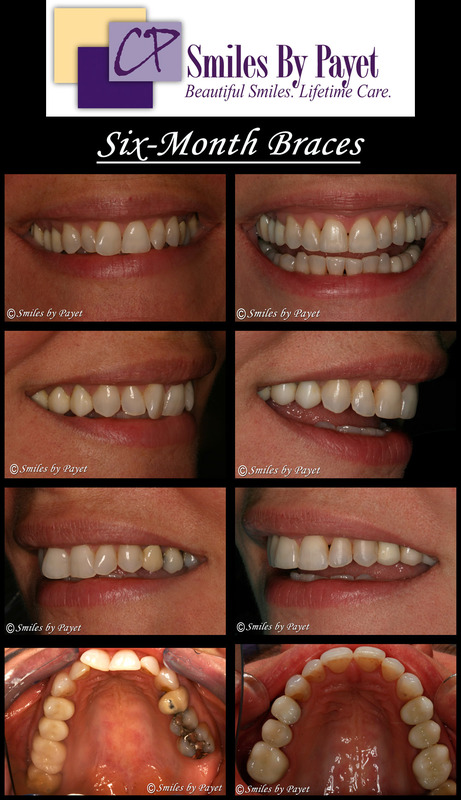 Porcelain Veneers to Correct Crowded Teeth – 1 Option for a Beautiful Smile! We’re often asked what is the “BEST” way to make a person’s smile the way they’ve always wished; should they do orthodontics (braces), should they have a “gum lift” (esthetic crown-lengthening), should they choose veneers? Of course the answer is, “It depends.” Each has advantages, each has disadvantages, so you must personally weigh each option very carefully to make the most informed decision for yourself. The option that many choose for correcting crooked teeth, though, is that of Porcelain Veneers. Veneers, also known as Laminate Veneers, are very thin porcelain shells, individually hand-crafted by a skilled laboratory technician, that are bonded onto the teeth. There must be clear and excellent communication between the patient, the dentist, and the laboratory, for veneers can truly be customized to create the look that you want: Shape/Contour, Translucency, Color, Brightness…..
Veneers single biggest advantage over Braces is the speed with which a smile makeover can be completed. Unless there are complicating factors (and there often are, so it’s wise to be prepared), a Smile Makeover can be completed with veneers in only 3-4 weeks. Of course, the disadvantages are that some healthy tooth structure must be removed so the teeth don’t look like horses’ teeth, and the fee is usually significantly higher. Linda’s veneers (10 on the top, 10 on the lower teeth) were completed 6 years ago and are still providing Linda the smile she’d wanted since she was a child but never had.